Crowdsourcing [basically getting a whole load of enthusiastic interested people to do your testing for you] as a method of obtaining data has proved to be a very useful tool for scientists in a range of disciplines. For years the Search for Extra Terrestrial Intelligence has been using the computers of willing participants to analyse their information, but now they are looking for a more active "human" element. At the TED (Technology, Entertainment and Design) conference in Los Angeles last week, SETI announced that they will begin streaming radio frequencies that are transmitted from the Allen Telescope Array through a new website Setilive.org. Users of the site will be asked to search for signs of unusual activity within the frequencies as it is hoped that the human brain can discover something the automated system may not catch. Seti Live is the latest stage SETI's quest "to empower Earthlings everywhere to become active participants in the ultimate search for cosmic company". Dr Jillian Tarter, Director of the SETI Institute's Center for SETI Research has devoted her career to the search and is head of the new initiative. "There are frequencies that our automated signal detection systems now ignore, because there are too many signals there," she said. "Most are created by Earth's communication and entertainment technologies, but buried within this noise there may be a signal from a distant technology. I'm hoping that an army of volunteers can help us deal with these crowded frequency bands that confuse our machines. By doing this in real time, we will have an opportunity to follow up immediately on what our volunteers discover." Colonel "Whopper" Creedon, Acting Director of Intelligence for UNETIDA, condemned SETI's work as a "nuisance" and called Seti Live "dangerous and irresponsible" as he warned that the program participants may inadvertently hasten an attempted invasion by an almost certainly belligerent alien race that could cause unprecedented damage to our way of life. 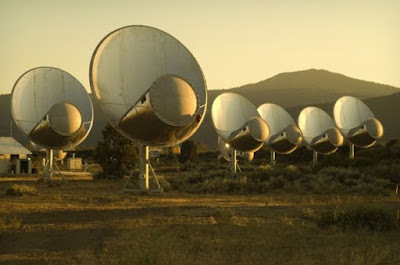 It is believed that the Colonel will have UNETIDA Information & Communications introduce a "rogue" signal into the Allen Array to keep Seti Live enthusiasts baffled and out of his hair for years.